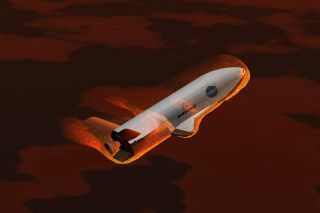 An artist's illustration of the unmanned X-37B space plane during re-entry. The U.S. Air Force's robotic X-37B space plane finally returned to Earth Saturday (June 16), wrapping up a mysterious mission that lasted more than year in orbit. The unmanned X-37B spacecraft, also known as Orbital Test Vehicle-2 (OTV-2), glided back to Earth on autopilot, touching down at California's Vandenberg Air Force Base at 5:48 a.m. PDT (8:48 a.m. EDT, 1248 GMT). The landing brought to an end the X-37B program's second-ever spaceflight, a mission that lasted more than 15 months with objectives that remain shrouded in secrecy. Air Force officials announced the X-37B space plane's successful landing in a brief statement posted on the Vandenberg website and emailed to reporters. The X-37B stayed in orbit for 469 days this time, more than doubling the 225 days its sister ship, OTV-1, spent in space last year on the program's maiden flight. Officials at Vandenberg said the spacecraft conducted "on-orbit experiments" during its mission. The landing window for the X-37B actually opened on June 11, and was expected to close on Monday (June 18). OTV-2 launched aboard an Atlas 5 rocket from Florida's Cape Canaveral Air Force Station on March 5, 2011. The space plane was designed to stay aloft for 270 days, but the Air Force kept it flying well beyond that milestone in a mission that officials recently called a "spectacular success." "With the retirement of the space shuttle fleet, the X-37B OTV program brings a singular capability to space technology development," said X-37B program manager Lt. Col. Tom McIntyre in today's statement. "The return capability allows the Air Force to test new technologies without the same risk commitment faced by other programs. We're proud of the entire team's successful efforts to bring this mission to an outstanding conclusion." An X-37B robotic space plane sits on the Vandenberg Air Force base runway during post-landing operations on Dec. 3, 2010. Personnel in self-contained protective atmospheric suits conduct initial checks on the robot space vehicle after its landing. This same craft is due to launch again in fall 2012. Exactly what the spacecraft, which is built by Boeing, was doing up there for so long is a secret. The details of the X-37B's mission, which is overseen by the Air Force's Rapid Capabilities Office, are classified, as is its payload. This secrecy has led to some speculation, especially online and abroad, that the X-37B could be a space weapon of some sort — perhaps a sophisticated satellite-killer. Some experts also suspect that the vehicle may be an orbital spy platform. The Air Force, however, has worked to tamp down such speculation, stressing repeatedly that the X-37B isn't doing anything nefarious hundreds of miles above the Earth's surface. "This is a test vehicle to prove the materials and capabilities, to put experiments in space and bring them back and check out the technologies," Richard McKinney, the Air Force's deputy undersecretary for space programs, said shortly after OTV-1 landed in December 2010. "My words to others who might read anything else into that is, 'Just listen to what we're telling you,'" McKinney added. "This is, pure and simple, a test vehicle so we can prove technologies and capabilities." The X-37B looks a bit like NASA's recently retired space shuttle, but it's far smaller. The X-37B is about 29 feet (8.8 meters) long and 15 feet (4.5 m) wide, with a payload bay about the size of a pickup truck bed. Two X-37B vehicles could fit inside the payload bay of a space shuttle. The spacecraft's orbital longevity is enabled by its solar array, which generates power after deploying from its payload bay. This size chart shows how the Boeing-built X-37B robot space plane compares to NASA's space shuttle, a larger version of the spacecraft called the X-37C and an Atlas 5 rocket. While the X-37B currently flies only hush-hush missions for the Defense Department, its spaceflight role may be expanded in the future. In its current state, the vehicle could fly cargo missions to the International Space Station, docking to the orbiting outpost's common berthing port, Boeing officials have said. Boeing is also looking into building a larger variant of the spacecraft called the X-37C, which could ferry up to six astronauts to the space station. The X-37C would be 65 to 80 percent bigger than the X-37B. Originally, NASA used the X-37B as an experimental test bed until funding for the project ran out in 2004. The vehicle then passed to the Defense Advanced Research Projects Agency, and it was ultimately turned over to the Air Force in 2006. Vandenberg officials said the next X-37B mission will launch sometime later this year, most likely during autumn. That mission will use the first X-37B to fly, OTV-1, lofting it to orbit for a second flight.